This recipe for cheese burek (burek sa sirom), a Balkan savory filo pie that can be filled with cheese, meat or vegetables, is made with Jack and cottage cheeses in a 13x9-inch pan like baklava. There are myriad versions among Serbs, Bulgarians, Bosnians, Macedonians, Greeks, and Turks. The Jack and cottage cheeses in this recipe definitely make it an Americanized version, but delicious nonetheless! Place oven rack in the middle position and heat to 350 F. Lightly coat a 13x9-inch pan with cooking spray. In a large bowl, toss grated Jack cheese with flour. Add undrained cottage cheese and beaten egg and mix thoroughly. Set aside. Separate filo dough into two piles (about 14 sheets each) and keep covered. Half will go on the bottom of the pan and half will go on top of the filling. Place 2 sheets of filo dough in prepared pan and brush lightly with melted butter. Add 2 more sheets of filo dough and brush with butter. Continue in this fashion until you've used one pile of filo sheets. Spread the cheese mixture evenly over the filo and to the ends. Begin covering the cheese with the remaining filo, again using 2 sheets at a time and brushing with butter. Tuck any overhanging filo dough down the sides of the pan and brush entire top with butter. Cut burek into 24 squares and generously brush the entire top with remaining butter. Bake in the heated oven for 25 minutes or until golden brown. If the top starts to brown too quickly, cover loosely with aluminum foil and continue to bake. Remove foil and bake an additional 5 minutes. This makes a great luncheon, entrée, brunch or appetizer course that can be served warm or at room temperature. A slice of burek goes great with a glass of cold. Burek freezes well cooked or uncooked. 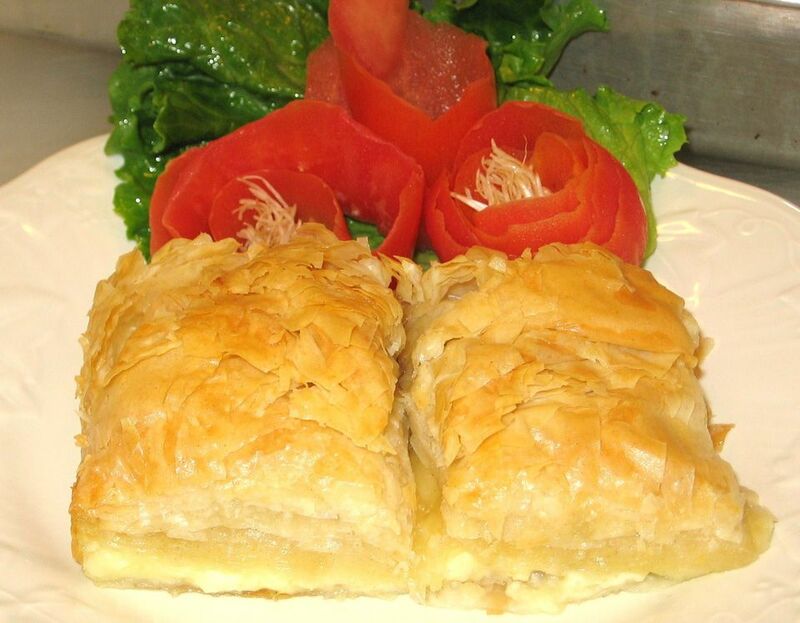 Meat Burek Recipe: This flaky meat pie can be made with all beef or a combination of beef, pork, and lamb. Spinach Pie Recipe: Known as Zeljanica in Serbian, this pie makes a great vegetarian dish but it isn't suitable for vegans because it contains dairy and eggs. Zeljanica can be compared to Greek Spinach Pie or Spanakopita.